The Loch Lomond Group, has today announced the launch of its largest Global Travel Retail initiative to date, with World Duty Free at Heathrow Airport’s Terminal 5. The company will be showcasing its Loch Lomond and Glen Scotia single malt portfolio, in an interactive installation at the airport until 24 April 2018. Loch Lomond, recently announced a five-year partnership with The Open, golf’s original championship, that will highlight globally the distiller’s full range of single malts. 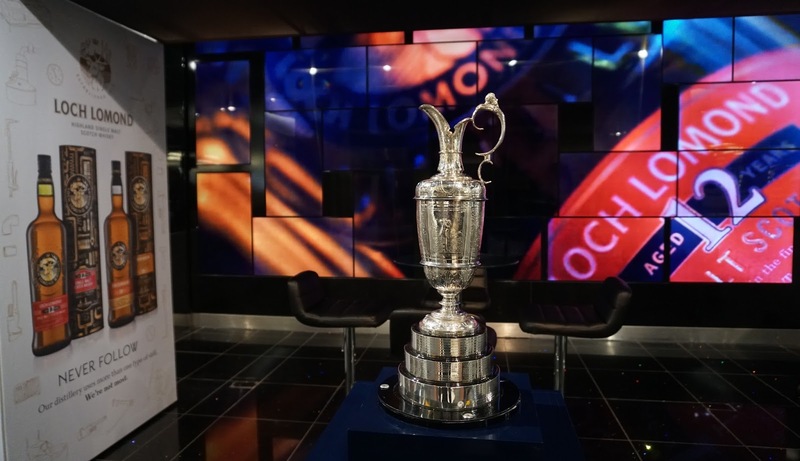 The space in the World Duty Free store in Heathrow’s Terminal 5 presents ‘The Spirit of The Open’ to the world, with large colour display screens featuring iconic imagery of the Scotch whisky distilleries and The Open. Travellers will also be able to view the impressive Claret Jug trophy on the stand until April 20th, and enter a competition to win tickets to The Open. Although the trophy has flown through Heathrow airport many times, it is the first time it has been displayed in Terminal 5. Loch Lomond Group’s partnership with World Duty Free follows on from the successful introduction of the company’s Global Travel Retail Scotch whisky range at all 16 World of Whiskies outlets in airports throughout the UK. The whiskies available include the recently launched Loch Lomond Inchmoan 10 Year Old single malt Scotch whisky.